A WEEK WITH INCREDIBLE BUT TRUE CREAM OF NATIONAL & INTERNATIONAL DANCERS (Pop'n PETE, Brian Green, Mr WIGGLES, E.joe Willson, Bboy Abstrakt, Kim Holmes, ARCHIE Burnette, Greg Campbellock Jr, Joseph "GO", Kmel boogie brats...) from 21 to 27 September Workshops, HDC Party, Who Is Who ? Warm'up party, WHO IS WHO ? Battle, an evening dedicated to the history of hip-hop dance. The "WHO IS WHO? BATTLE" organized ... The dancers train! for presets, which will be held on Saturday 26 September 2009 before the big day Sunday 27 September in PARIS (France). But who will dethrone this year! Perhaps You? YOU GO LIVE MOMENTS OF HISTORY! The "WHO IS WHO? 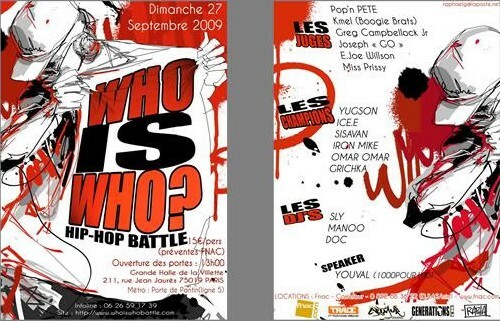 BATTLE" in honor to announce that we welcome for the first time in France and in Europe on Thursday, September 24 legendary event in New York the "HOUSE DANCE CONFERENCE" hosted by Brian GREEN. The schedule for the week is coming very soon on the website (www.whoiswhobattle.com).